It is December. It is getting cold at night. It was 16 degrees F a couple of nights ago. 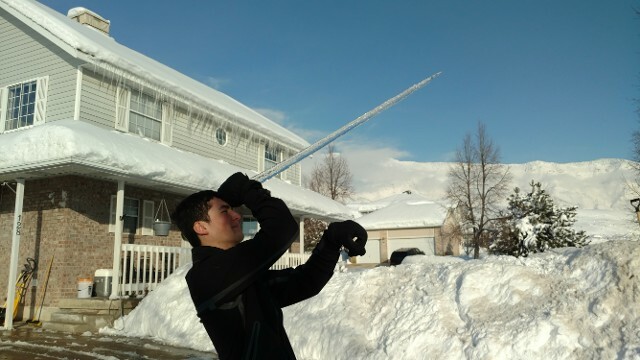 Of course my son thinks that icicles are horns so he becomes a unicorn this time of year. In this weather garages start getting really cold. Do you have a refrigerator in your garage? If you do it may stop working over the cold months of winter. Most refrigerators have the cooling system in the freezer. The freezer fan then blows cold air into the refrigerator section. Refrigerators that are over 15 years old had the cold control thermostat in the freezer. When the freezer got down to around 0 degrees F it would shut off and be satisfied. That refrigerator would be fine in a garage that was below 50 degrees F. About 15 years ago, engineers decided to move the cold control into the refrigerator section. When the refrigerator section hit 35 degrees F it would be satisfied and quit cooling. The problem is, when newer refrigerators are in a garage that is below 50 degrees F, the refrigerator doesn't kick on very often and the freezer temperature climbs into the high 20 degrees F. Ice cream gets soft and most freezer items aren't frozen very solid at that temperature. Unfortunately there is no good fix for this problem. Newer refrigerators were not designed to operate below 50 degrees F. So if your garage refrigerator starts acting wierd this time of year it may not be broken, it may just be too cold. That means that when the icicle unicorns go away for the season, your refrigerator in the garage should be running normally again.